While technology is making certain aspects of e-discovery faster and easier — think of the process improvements that technology-assisted review has produced — it is also creating new challenges as quickly as we can provide solutions to them. Between distributed data, mobile devices and the never-ending explosive rate of growth for all types of information, e-discovery has become more complex and harder to navigate every year. The good news is that there are concrete steps businesses can take to address those challenges, starting today. 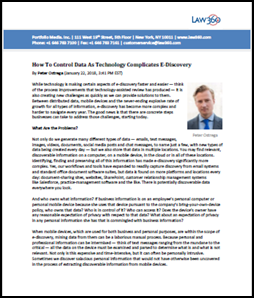 Read more in the article How To Control Data As Technology Complicates E-Discovery by Peter Ostrega. This article originally appeared on January 22, 2018 on Law360.com.